Interest in lightweight analogs of the novel superconductor magnesium diboride (MgB2) has motivated a search for new high pressure phases in metal boride systems. 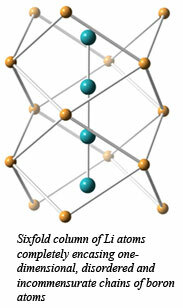 In the case of lithium monoboride (LiB), a previously unknown series of high pressure structures, some of which are expected to exhibit superconductivity, has been predicted theoretically [Kolmogorov et al., Phys. Rev. B, 73, 180501 (2003)]. In an experimental effort begun at CDAC, Amy Lazicki led a search for structural changes in LiB related to the predicted novel behavior. In collaboration, which involved CEA France, the Geophysical Laboratory, the University of California – Davis, and Washington State University found that LiB, while becoming increasingly disordered, maintains its ambient pressure structure up to at least 70 GPa. At 5 GPa, however, they discoverd an abrupt change in the evolution of the c/a lattice parameter ratio, which is likely related to pressure-induced electronic filling of Li-B bonding states. 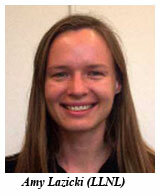 Lead author Amy is now a postdoctoral fellow at LLNL where she works on laser-driven dynamic compression experiments. The paper is published in Physical Review B [A. Lazicki et al., Phys. Rev. B, 82, 180102 (2010)].